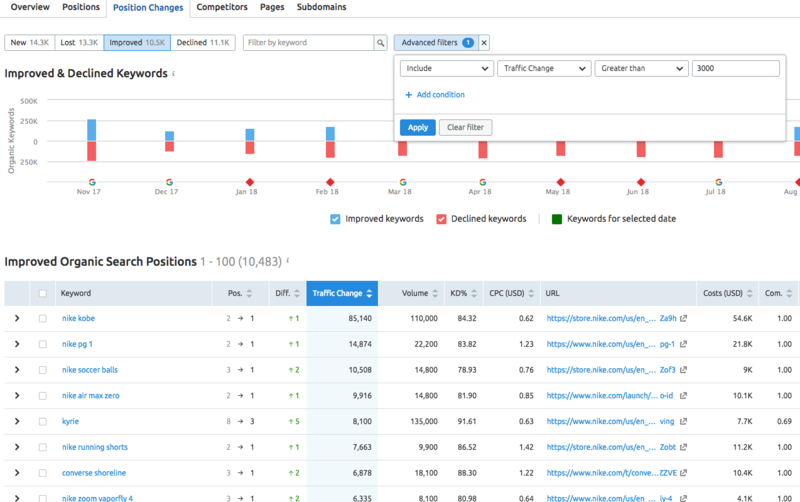 The Position Changes report shows the most recent changes in a competitor’s keyword portfolio. It can be broken down into four reports: New, Lost, Improved, or Declined keywords. Each report will have a bar graph display showing the trend and a table with details on the keywords gained or lost. In the graph, you can click on any of the red or blue bars and it will turn to green. Once it does this, it will repopulate the table below to show the keywords won or lost on that specific date. This is an easy way to spot your competitor’s current weak spots or recent campaigns. If they’re losing positions, maybe their content is outdated and represents an opportunity for you to take some of this traffic away from them. The “New” report shows keywords that are now ranking within the top 100 organic results for a domain based on the chosen time period. So if the report is set to one month, it will show the new keywords that the domain is ranking for that it didn’t have a month ago. The "Improved" report will show keywords that the domain is still ranking within the top 100 positions for, but has moved up in ranking since their previous position. New and Improved keywords both represent positive SEO. The “Lost” report will show keywords that the domain was previously ranking within the top 100 positions but is now no longer, and the “Declined” report shows results that have decreased in ranking yet still remain in the top 100. These two reports represent poor SEO performance. With all four of these different types of keywords, you can expand on the data by clicking on the keyword’s row. This will show you the keyword, URL, category and SERP Features associated with the keyword. You can also see a snapshot graph showing the position of the keyword over your designated time period. In the New, Improved, and Declined reports, you can see the URL’s current rank in the Positions column. In the Improved and Declined reports, you can see the old position and the new position to see just how much of a difference was made. This way, it’s easy to see just how drastic of a change in position the ranking page went through. For more specific analysis, use advanced filters. There are currently fourteen metrics you can use to filter this data with including by keyword, traffic difference, or CPC. See in the image below an example of a filter for traffic difference greater than 3000 in the Improved report. This would be a great report to show a client how you’ve helped improve their sites organic traffic. Just like in the Positions report, you can filter your report by the position of the keyword. This can be done using the positions dropdown filter. This lets you filter the report by the top 50, top 20, top 10 and top 3 keywords, as well as for positions #1, #4-10, #11-20, #21-50 and #51-100. What is the estimation (~ number based on passing) after I apply a filter to a report? How do keyword filters work? Why does the same keyword show twice in a Positions report? What is the difference between Branded and Non-branded keywords?